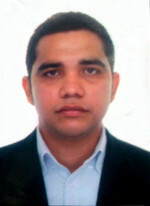 José David Bermúdez Castro was born in Barranquilla, Colombia in 1987. In 2009 he graduated in Electrical Engineering with emphasis in Electronics at the Univesidad Del Norte in Barranquilla. He received the M.Sc. degree in Electrical Engineering from the Pontifical Catholic University of Rio de Janeiro, in Signal Processing and Control specialization, Brazil, in 2015. He is currently doing the PhD Program in the Department of Electrical Engineering in the Pontifical Catholic University of Rio de Janeiro, in Signal Processing and Control specialization.